Make sure you have a business card for job and internship interviews. Our high-quality cards are printed on 16 pt stock high quality matte finish. 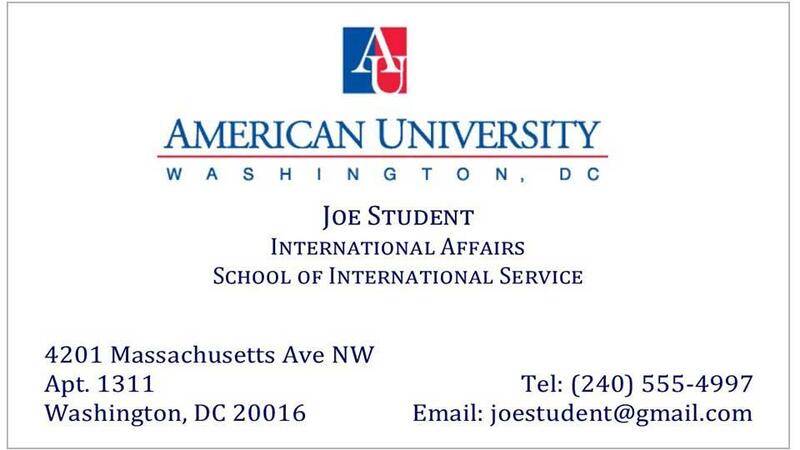 The cards are designed for American University students and are sure to impress. Get started by using the link below to access our Business Card Order Form, or feel free to Contact Us with questions. Ordering your AU Student Business Card could not be easier. You will receive a proof of your card within one business day. Your cards will be ready 3-5 business days after approval of the proof. Payment is due when you pick up your order at our AU campus store. Business cards are necessary for your interviews. Our professionally printed cards will assure that yourself as a serious, polished candidate. If you would like another design, please email us your own card creation or visit our online print store to choose a template.